This unstuffed whole roast turkey is basted during the last 30 minutes of cooking with a sweetly pungent honey-Dijon mustard glaze. Remove giblets and neck from turkey; reserve for gravy. 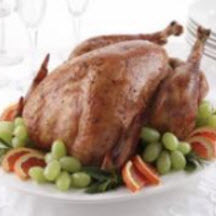 Rinse turkey with cold running water; drain well. Blot dry with paper towels. Sprinkle salt and pepper in the cavities of the bird. Fold neck skin and fasten to the back with skewers. Fold the wings under the back of the turkey. Return legs to the tucked position. Meanwhile, in small bowl, blend honey and mustard together. During the last 30 minutes of roasting time, baste the bird with the honey glaze. Continue to roast until the thermometer registers 180°F (85°C) in the thigh, or 170°F (80°C) in the breast. Remove the turkey from the oven and allow the bird to rest for 15 to 20 minutes before carving.